Dan Sullivan, OSU soil scientist, caught my attention during his presentation at the 2014 Building Soils for Better Crops workshop. Speaking about organic amendments and how to use them for both building soils and for nutrient supply to crops, Sullivan suggested that low nutrient organic amendments, like compost or composted manures, be used in combination with synthetic nitrogen fertilizers. This combo, he said, has benefits over the use of either by itself. The decomposition that produces compost reduces its nutrient content and stabilizes it. Because it has decomposed some, more of it will end up as soil organic matter than with fresh organic materials. When compost is applied to a field, it will continue to decompose slowly – faster as the soil warms up – releasing a slow stream of nitrogen into the soil solution. If the compost is being used as a nitrogen source, this flow of nitrogen often cannot keep up with crop demand. One option is to use organic materials with higher amounts of available nitrogen, but these are very expensive; I found a liquid hydrolyzed fish product that could be applied through irrigation water, but it cost $17.76 per pound of nitrogen, over 20 times the price of synthetic fertilizer nitrogen. At this price, these materials make economic sense only for very high value organic crops. This is most likely why organic wheat, a lower value crop than organic vegetables or fruit, produces less grain with lower protein content than wheat produced with synthetic nitrogen fertilizers (Seufert et al., 2012). Although inexpensive and easy to apply, synthetic fertilizer nitrogen also has problems. Its nitrogen is too available, with nearly all of it going to the soil solution when it is applied. In the soil solution, it is susceptible to leaching by high rainfall events (in the Midwest) or over-irrigation (in dryer regions). Once moved below the root zone, it is a loss to the farmer, and causes problems in both ground and surface waters. Here is where Sullivan suggests the combo; use a pre-plant application of organic amendment for a slow-release, base supply of nitrogen, and then later applications of synthetic nitrogen fertilizer to meet the crop’s peak demand. There are several advantages for farmers who do this. As Sullivan points out, they can spread a lower amount of compost over more acres because they are not relying on it for their full nitrogen needs. 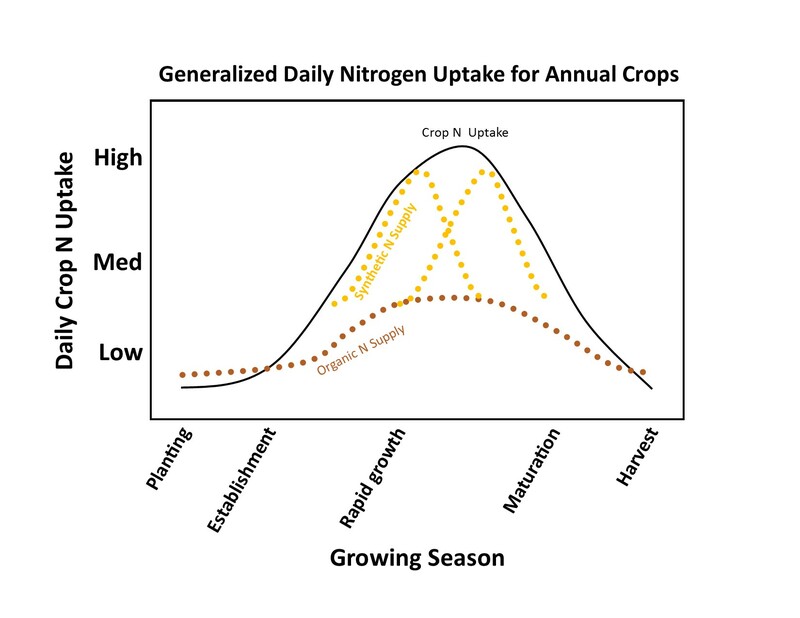 They can also spread out their nitrogen applications over the season, with the organic amendment and a smaller amount of synthetic nitrogen (ideally slow-release, like polymer coated urea) applied before planting, and then one or more applications of synthetic nitrogen later in the season as the crop demand ramps up. Multiple applications like this can easily be made through sprinkler irrigation systems, or if the crop allows, by ground units that dribble liquid fertilizer on the ground or spray it directly on the crop. So, this combination of organic amendments and synthetic nitrogen fertilizer is good for soils, good for water quality, and good for farmers, but are they using it? In 2015, we sampled fields of farmers using composted manures with fertilizers in the Columbia Basin and compared the soils to those from adjacent fields not receiving compost. The results show that this works; the combo-treated soils had higher organic matter and respiration levels (one measure of biologic activity) while, we presumed, producing profitable yields. Increasing soil organic matter while still using tillage, and with only moderate rates of 4-5 tons per acre per year, and in light-textured soils, shows the power of this organic plus synthetic combination. View Sullivan’s (Nutrient Availability and Soil Health) and other speaker’s presentations on the CSANR website. This year’s Building Soils for Better Crops workshop is scheduled for November 29th in Moses Lake. More information will be available by September. A WSU publication with the details of our 2015 soils work should be released by late this year. Seufert, V., N. Ramankutty, and J.A. Foley. 2012. 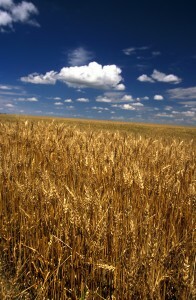 Comparing the yields of organic and conventional agriculture. Nature 485: 229–232. Magdoff, F. R., & Amadon, J. F. (1980). Yield Trends and Soil Chemical Changes Resulting from N and Manure Application to Continuous Corn. Agronomy Journal, 72(1), 161–164. Found the highest crop yields from a combination of manure and fertilizer. Jate, M. (2012). Impact of Mineral Fertilizer Integration with Farmyard Manure on Crop Yield, Nutrient Use Efficiency, and Soil Fertility in a Long-Term Trial. A long-term study that found yields of potato, rye, and oats were best with manure and fertilizer compared to manure or fertilizer alone. The combination also showed the highest nutrient use efficiency. One thought on "The Benefits of Combining Organic and Synthetic Nitrogen Sources"
I buy an organic 4-3-2 granular fertilizer, made from chicken manure, from Wilbur Ellis for $8.32 per 50 lb bag. For my purposes, this is dirt cheap.